One of the things we miss most about summer is fresh basil from the garden. Yes, we made pesto and put it in the freezer in anticipation of the January blues, but we wish we could somehow bottle that wonderful flavor. 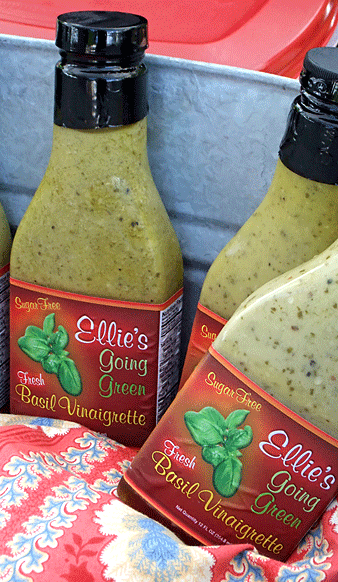 And that’s exactly what four enterprising women did just over a year ago, creating Ellie’s Basil Vinaigrette. 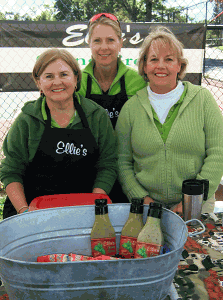 Actually, Ellie Monnin, a chef, had been making the vinaigrette for many years, but last July, she got together with Darnell Vipperman, Barbara Bane, and Heidi Jarcho to turn it into a business. All four partners are Marblehead residents, and the product is currently made in the town’s St. Andrew’s Church kitchen. The dressing is not only delicious, it’s sugar free, cholesterol free (it’s made with extra virgin olive oil), and gluten free. It’s also highly versatile—it can be used to dip bread or artichokes, as a dressing for potato salad, or a marinade for fish, chicken, or beef. It’s also good with hot pasta, as dressing for pasta salad, and drizzled over vegetables. We had it last night over chopped tomatoes and cubed fresh mozzarella for an easy, extremely tasty side dish. Thus far, the vinaigrette has only been available at the Salem and Marblehead farmer’s markets. But Monnin and her partners are looking for a commercial kitchen where they can produce larger quantities and hope to have it in local stores this winter. Once that’s accomplished, they plan to expand into other products (they mentioned cookies), so stay tuned. Photo: Darnell Vipperman (left), Barbara Bane (middle), Ellie Monnin (right), and Heidi Jarcho (missing).